Live like tomorrow's your lucky break! My father was an artist. He had many other jobs throughout his career, but he loved painting, and he often supplemented our income with sign painting jobs. You may know the Lehi Roller Mills that was featured in Footloose. Among other things, my father painted the turkey on the grain silo, and it paid for the hospital bills when my little sister Cindy was born. He was also a storyteller, and loved illustrating his stories. 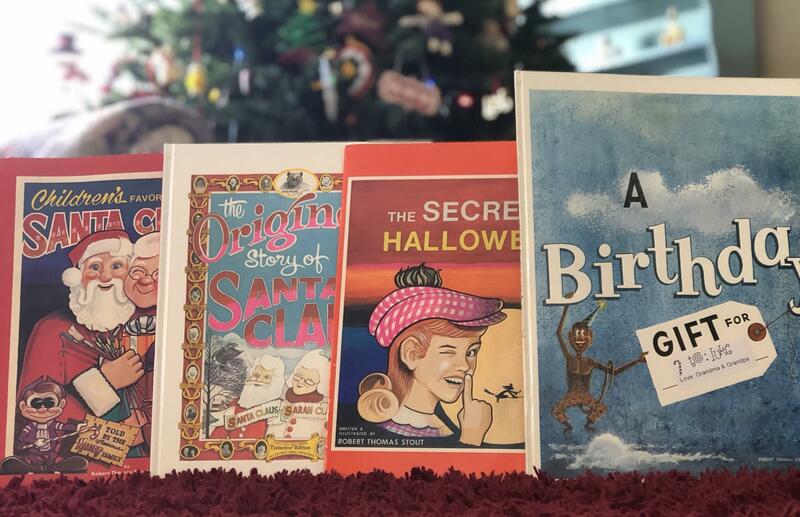 He self published four books, called The Original Story of Santa Claus, Children’s Favorite Story of Santa Claus, Children’s Favorite Story of Halloween, and A Birthday Gift. They never became a bestsellers, but definitely became favorite family classics. Now that he is gone, they have taken on a greater significance. We still read the Children’s Favorite Story of Santa Claus every year at the Stout Family Christmas party. No wonder from a young age, I aspired to be an artist too. Dad always had a workshop where ever we lived. No matter where we lived--California, Utah, Tokyo, Colorado Springs, Coeur D'alene, Kobe, Boise, Tempe, and and Orem, we never parked our car in the garage because that was Dad’s workshop. It was always full of butcher paper, paints, brushes, paint thinner for cleaning up, and the smell of creativity and endless possibilities. When I was in first and second grade, we lived in Colorado Springs. This is when I started drawing; I did portraits of my family members, I drew Pikes Peak. My elementary school had a painting contest, and I painted a burning building that was selected for a prize and was displayed at an old history building downtown. My family took a trip to see it, and I was hooked after that! Later, my mother’s parents visited us for Christmas, and of course they were very complimentary of the art I shared with them. My Grandpa said that I was a budding artist. At first I thought he was making some kind of crude joke. But my mother explained that budding means developing, like flower bud that turns into a flower. Whenever I met someone, I introduced myself as a budding artist! Some of you may know that I lived in Japan for several years growing up. My father’s job took us to Asia, where I attended Japanese kindergarten and several years at an international school in Kobe. Japanese culture had a huge influence on me as an artist. This was also the beginning of the comic book boom there. Being a visual learner, I loved the idea that many ideas could be enhanced through a visual medium like drawing and painting. Japanese animation was also just beginning to explode. Honestly, my older brother Rick was way better at drawing than I was, but he was more interested in other things, like working, reading, and sports. Not that I wasn’t. But, I was obsessive about artwork. Even if it was just for a few minutes, I never let a day go by without drawing. In high school Rick talked me into reading the Lord of the Rings, and I loved it. I started doing sketches and watercolors of the scenes that impressed me visually. 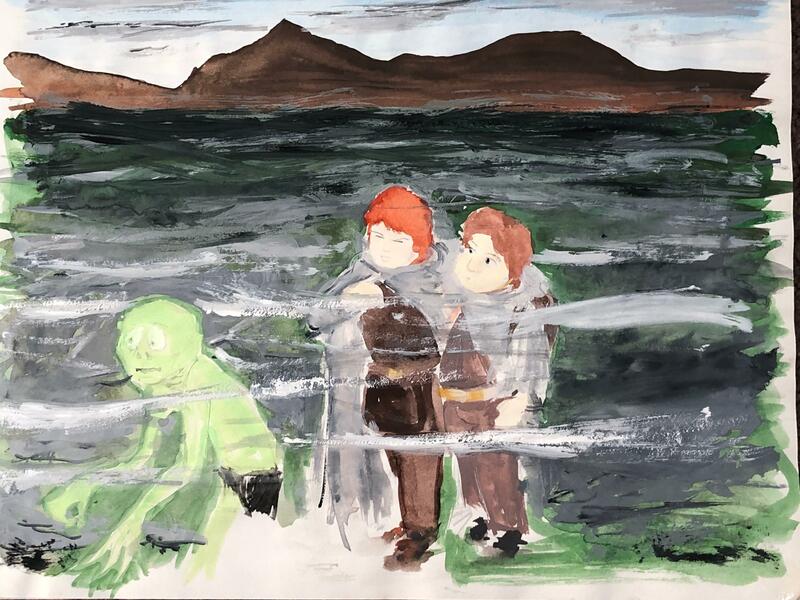 I did Frodo and Sam setting out from the Shire, the Riders of Rohan, the capture of Gollum, and others. That was in 1986. There was a cool interaction between reading and my art. The books gave me inspiration, and the pictures reminded me of various scenes in the books. At least the way I saw them. 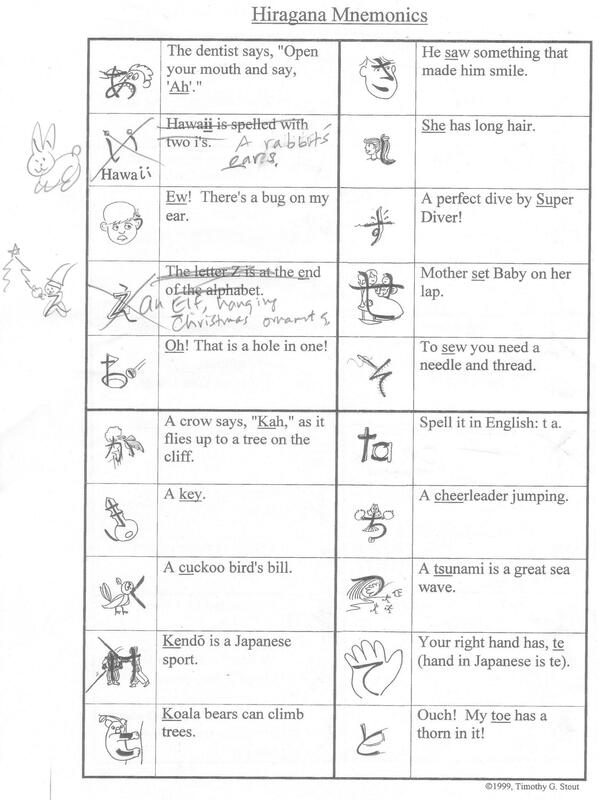 When I started teaching Japanese in 1992, I wanted a better way to teach hiragana and katakana characters. Some students had a very hard time remembering them. So, I drew pictures as mnemonics, or memory helps. They really helped some students to learn and recall them, even if they were sometimes lighthearted and silly! Here’s a close up example for the hiragana character も (mo), and it’s mnemonic picture and text. When I graduated from BYU, our commencement speaker was Dr. Truman Madsen, who encouraged us to never be content, but to push to the top of whatever field we chose to pursue. So, while I was teaching at ASIJ, I applied and got into Columbia University’s Master’s Degree program in Japanese Pedagogy. My principal at the American School in Japan, where I taught Japanese, randomly asked me one day, “So, when are you going to get thoughs mnemonic pictures published?” I had never thought about it. But, it did get me thinking. That summer when school got out, I started researching how to get published. I read several books. Then, I made a plan. I wrote up a proposal, included some of my artwork, and sent it off to half a dozen of the most likely publishers to pick up my work. I received several rejections, and then didn’t hear anything for several months. Then, one day I received an email from Eric Oey, current CEO of Tuttle Publishing, and nephew of Charles E Tuttle, founder of one of the largest publishers of books about Asia in English. I was shocked and thrilled! He said that he was interested in my book proposal, and that he was coming to Japan, and would like to discuss it further in person. We had a good meeting, where he said they were looking for a new author to write a series of Japanese textbooks. This was much more than I was expecting, but after some thought, decided to do it. Then came the big challenge--Eric Oey wanted me to get someone else to do the final illustrations! He liked my ideas, but wanted me to hire someone else to do the artwork! I was crushed. I thought that was why he had wanted me to do the books in the first place. Apparently not. It was probably my educational background that interested him most. I did not reply for a while, as I nursed my pride. Then, I realized it was still a great opportunity, so I decided to go for it! After a long search, I finally found a illustrator that I felt I could work well with, named Alexis Cowan, a family member of a some friends of ours in Japan. 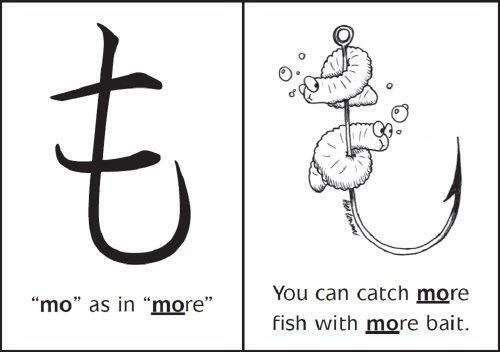 Here is Alexis’ version of the も (mo) mnemonic picture. It’s great! 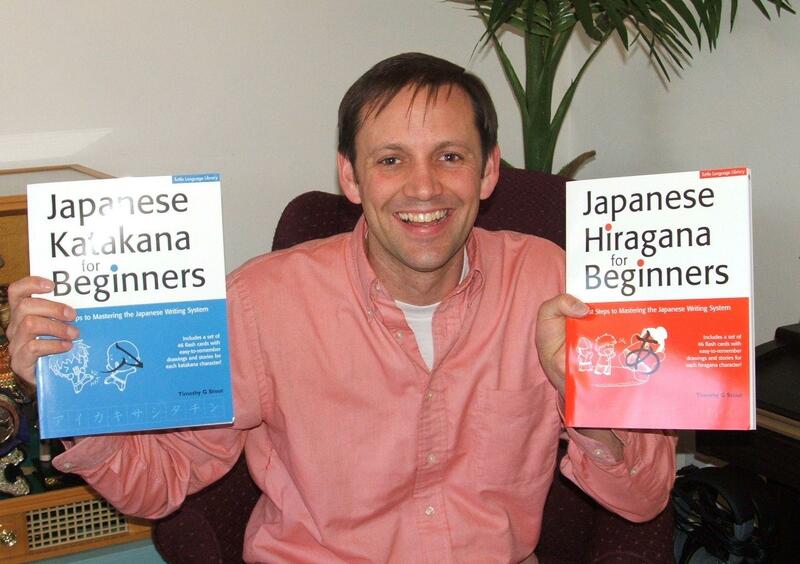 My first two books came out in 2007; they were called, Japanese Hiragana for Beginners and Japanese Katakana for Beginners. I was so proud to give a copy of each to my father. He was my original inspiration, and in some ways, the reason I got the opportunity to learn Japanese in the first place. These books did well, and I loved reading all the reviews, both positive and negative. It made my day every time someone wrote about how my books helped them reach personal goals of learning Japanese. These first two books were later combined into one book that was republished in 2011. This volume has done very well. On Amazon it has five stars with over 400 reviews. This first book led to many other opportunities, including one book that was published January of this year. I eventually lost my illustrator, so I started searching for another one. I advertised on Craig’s List, and received numerous submissions. They were really good, too. Still, I was a bit jealous of these other artists. I was taking a walk with my wife one afternoon, when she asked, “Why don’t you do it?” “Do what?” I asked. “Why don’t you do the illustrations?”, she responded. I had not even thought of it as a possibility. Tuttle had initially told me no. But, that really got me thinking: Why don’t I submit a few sample illustrations and ask my publisher and coauthor, without telling who drew what, which ones they liked best? To my delight, they both wrote back that they liked the ones I did! I thought they might be upset or disapproving that I submitted illustrations along with the others. But, the fact that they picked mine, gave me loads of confidence. These are the illustrations I sent to the publisher and my coauthor, Kaori Hakone. The first is my concept art, the next three submissions came from other illustrators through Craig’s List. The last one is the one I did. Over the past four years, I have illustrated nearly 500 illustrations for our Chinese classes. Tuttle wants to publish them in a new book. But, I am thinking of trying a new business model. Inspired by Pat Flynn’s SPI podcast, I have believe it may possible to better serve Chinese learners in other media besides just books. So, I am slowly learning how to create videos that might deliver the mnemonic illustrations in more engaging ways. But, that’s for another conversation. A few years back I got my first YouTube fan. Then, this year, I got my first YouTube hater (below). Which is actually a good thing. It means that I’m finally reaching people. When you put yourself out there, should expect some negative feedback, but not let it worry you too much. Life gives us lucky breaks, but we have to be ready to take them! They often come at inconvenient times and in unexpected ways. Still, these are the opportunities that can propel us ahead in life. And the only way to really take full advantage of them is by preparing for them before they we even know what they are. So, live like tomorrow is your lucky break! And be ready to take that chance when it comes! Do what you love as much as you can. Find your passions, develop your talents, and look for those lucky breaks, because they will come--in the least expected way and time!